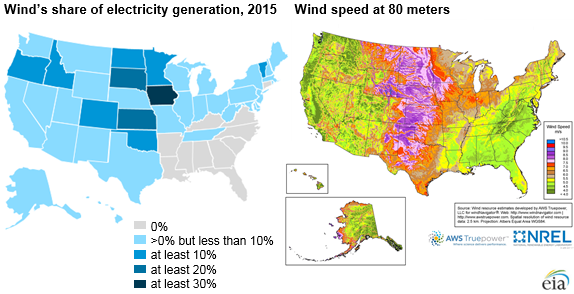 In 2015, 11 states generated at least 10% of their total electricity from wind. As recently as 2010, only three states had at least a 10% wind share. Iowa had the largest wind generation share, at 31.3%, and South Dakota (25.5%) and Kansas (23.9%) had wind generation shares higher than 20%. Two additional states, Texas and New Mexico, are on track to surpass a 10% wind generation share in 2016, based on data through July. Wind generation in Texas, the highest wind electricity-producing state, made up 24% of the national total wind generation and 9.9% of Texas's total electricity generation in 2015. 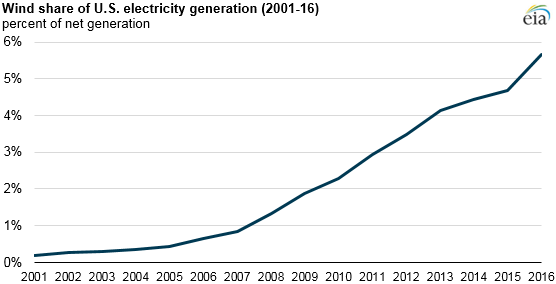 At the national level, wind's share of total U.S. electricity generation has risen every year since 2001. Wind facilities produced 190,927 gigawatthours (GWh) of electricity in 2015, accounting for 4.7% of net U.S. electric power generation. This level represents a doubling of wind's generation share since 2010, when the share was 2.3%. Based on monthly data through July, wind has provided 5.6% of U.S. generation in 2016. Note: 2016 based on data through July. States with the highest wind generation shares are located in the Central High Plains and the Rocky Mountains, regions that have high wind resources. The increase of wind power in the United States has been driven by a combination of technology and policy changes. Technological changes include improved wind technology and increased access to transmission capacity. Policies such as the Federal Production Tax Credit (PTC), Investment Tax Credit (ITC), and state-level renewable portfolio standards (RPS) have led states to build more wind capacity. The PTC grants a federal tax credit on wind generation, while the ITC allows federal tax credits on wind farm investments. State RPS, meanwhile, require that a minimum percentage of electricity generation comes from renewable energy. Twenty-nine states and the District of Columbia have RPS policies, and an additional eight states have renewable portfolio goals. Besides RPS, many states provided incentives—such as mandated purchases and an exemption from property tax—to encourage wind power in their states. More information on state policies that have affected the adoption of wind power is provided in EIA's Electricity Monthly Update. Few other renewable fuels make up 10% or more of states' electricity generation. Hydropower—the most common renewable electricity generation fuel in 2015—made up at least 10% of electricity generation in 10 states in 2015, including more than two-thirds of Washington's generation. Solar-powered electricity generation, including solar thermal, utility-scale photovoltaic, and distributed photovoltaic resources, made up 10% of California's electricity generation in 2015. Rooftop solar panels made up 38% of the District of Columbia's electricity generation in 2015, although the District has few utility-scale generators in its borders and imports most of the electricity consumed by District customers from neighboring states.